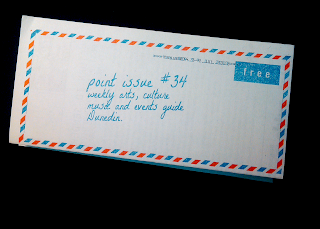 POINT issue#34 (3-9 JULY 2013) with a conoisseur's cover includes POINT Ed's thoughts on the topsy-turvey rhetoric of environmentalism as it finds itself currently being broadcast, Anne Marie Niven's review of the film WHITE LIES and the first part in Malcolm Dean's well received article on the fate of the postal service. Marketing of films tends to fall into only a few major categories: either a film is produced and marketed from the outset as a commercial ‘blockbuster,’ some kind of specific genre effort, or it falls into the catch-all category of ‘art-house’ or ‘festival’. Usually it is clear as to which category a film and its marketing belong, but the ever greater push to commercialise the obscure has leant itself to a number of self-consciously hybrid forms. White Lies, directed by Mexican ex-pat Dana Rotberg and based on Witi Ihimaera’s short story/novella Medicine Woman, seems to be one of these hybrid (or perhaps schizophrenic) efforts. At first sight, Ihimaera’s post-colonial tale of identity politics and the quirks of Rotberg’s previous productions, would seem to situate the film steadfastly inside the ‘festival’ crowd. But South Pacific Pictures, sensing (or doing their very best to plan into existence) an ‘unexpected’ runaway boxoffice success have pushed the film as a much more commercial endeavour with the hope, often explicitly mentioned in their publicity, of achieving the kind of ‘success’ which Ihimaera’s last script (for Whale Rider) earnt. With all the money and effort the producers are putting into its marketing it is perhaps a little difficult to extract the film itself from all the paratextual paraphernalia - it’s even difficult to decide what is text and what is paratext amongst the froth . . . to coincide with the film’s release we even see Random House publishing a new edition of Ihimaera’s story under its new title White Lies. Despite the evident desperation of the spin, the film itself is fairly engaging. Although it opens with a brutally ‘black and white’ prefatory sequence and some cringingly wooden performances (particularly with the poorly caricatured background characters), the story’s trajectory eventually finds its feet as do the three central actors. Whirimako Black, Rachel House and Antonia Prebble unfold the tale of (almost...) unexpected colonial identity theft into a tensely emotional intimacy, at times paranoid and racked with a sense of intrigue and deception. Tuhoe Medicine Woman Paraiiti (Black) is secretly engaged to abort the unwanted child of the wealthy young wife of an absent European patriarch. The initial distance between these two characters is mediated by House who plays a ‘repressed’ Maori servant to her mistress the wife (Prebble). The film is at its best as the three characters unwind the charged personal complexities of the twisted identity politics which Ihimaera’s story presents. The film benefits from the translation of most of Paraiiti’s part and bits and pieces of other parts of the script into Te Reo (with accompanying subtitles) although I have heard that some of the translations are a bit clunky and anachronistic (something I cannot comment on, not having any Te Reo to judge by). But it ultimately doesn’t quite work . . . Despite great performances from the three main actors and the expert work of Alun Bollinger with the camera, the supporting infrastructure is far too clumsy: the complexities of the personal identity politics are not matched by realistic complexities outside the menage á trois or in the macro politics. This may be because a feature film demands more complex background than the short story it’s based on can supply, or it may simply be due to heavy handed direction which makes black and white (rather than the grey the story seems to demand) of white lies. It is here that the desperate flavour of the film’s paratextual marketing blurs into the commercialising simplicities in the film’s textual fabric.